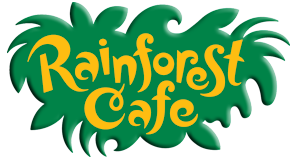 WELCOME TO THE RAINFOREST CAFE RESTAURANT NIAGARA FALLS ONTARIO, AN ADVENTURE IN CASUAL DINING! The Rainforest Cafe is located on Falls Avenue Resort directly across from the Falls. This Niagara Falls restaurant offers guests a menu to suit every taste featuring family favourites including salads, burgers, pastas and signature sandwiches. Customer service is a priority at the Rainforest Cafe, you will receive exceptional guest service from the moment of your arrival in the jungle to your departure and all points in between. The decor inside the Rainforest Cafe will captivate you. As you enter through the 80 foot bubbling volcano the rainforest comes alive with animatronic snakes, elephants, and gorillas. The Rainforest Cafe is also the only location where you can experience an indoor thunderstorm every half hour, once the thunderstorm ends make sure to look out for shooting stars and the hidden face in the Starscape. For those wanting to take a bit of the Rainforest home with them, the Rainforest Cafe offers an extensive line of merchandise.